Download "What Are You Mailing to an APO/FPO Address?" 1 What Are You Mailing to an APO/FPO Address? Knowing the shape of your mail helps you select the right service. Postcard * Length Height Thickness 5 inches 3-1/2 inches inches 6 inches 4 - es Rectangular cardstock mailpiece not contained in an envelope Letter / Large Postcard 5 inches 3-1/2 inches inches 11-1/2 inches 6-1/8 inches Small rectangular mailpiece no thicker than ¼ inch Large Envelope / Flat ** 11-1/2 inches 6-1/8 inches 15 inches 12 inches 3/4 inch Flat rectangular mailpiece no thicker than ¾ inch Package Length + girth ( around the thickest part of the package): Can not exceed108 inches. Can not exceed 130 inches with a surcharge (not available for Priority Mail). Weight can not exceed 70 pounds. 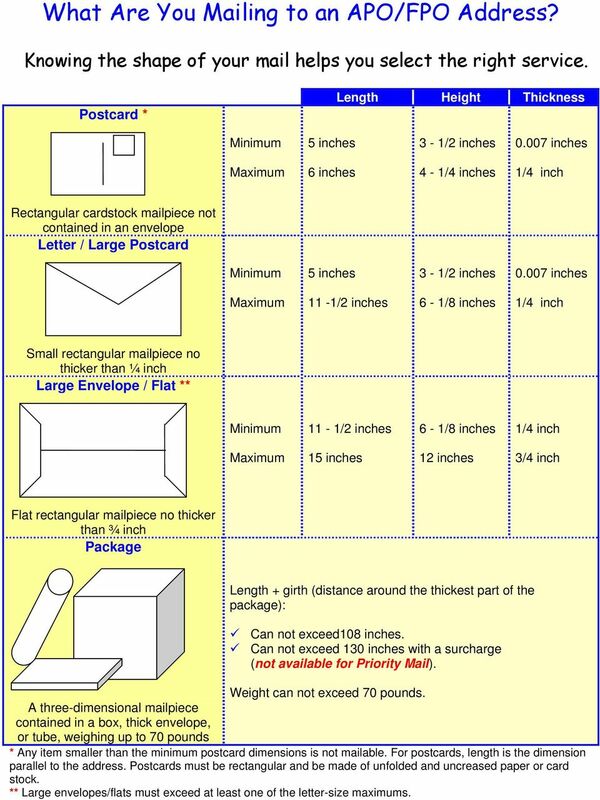 A three-dimensional mailpiece contained in a box, thick envelope, or tube, weighing up to 70 pounds * Any item smaller than the minimum postcard dimensions is not mailable. For postcards, length is the dimension parallel to the address. Postcards must be rectangular and be made of unfolded and uncreased paper or card stock. 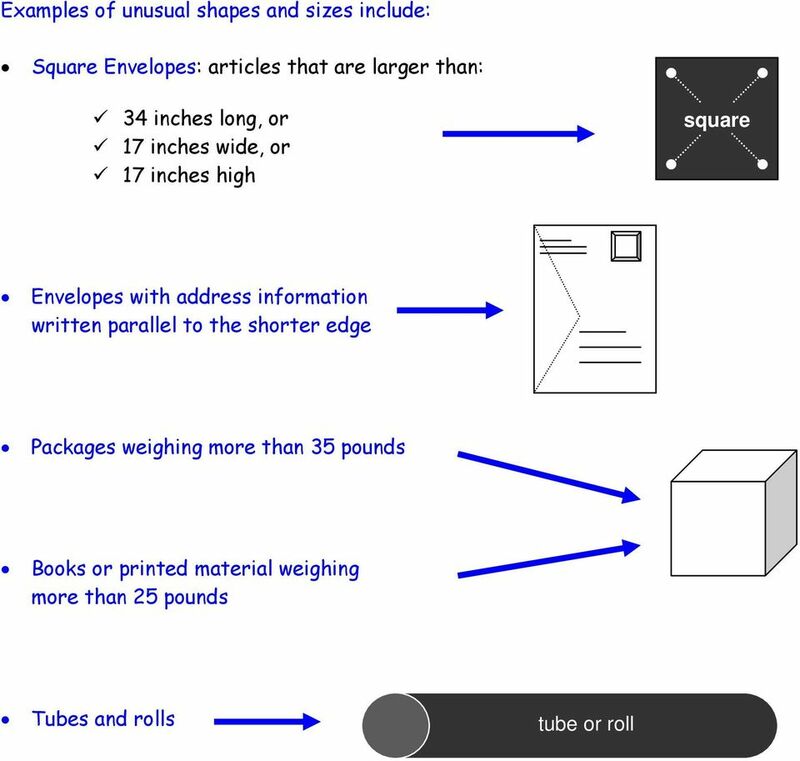 ** Large envelopes/flats must exceed at least one of the letter-size maximums. 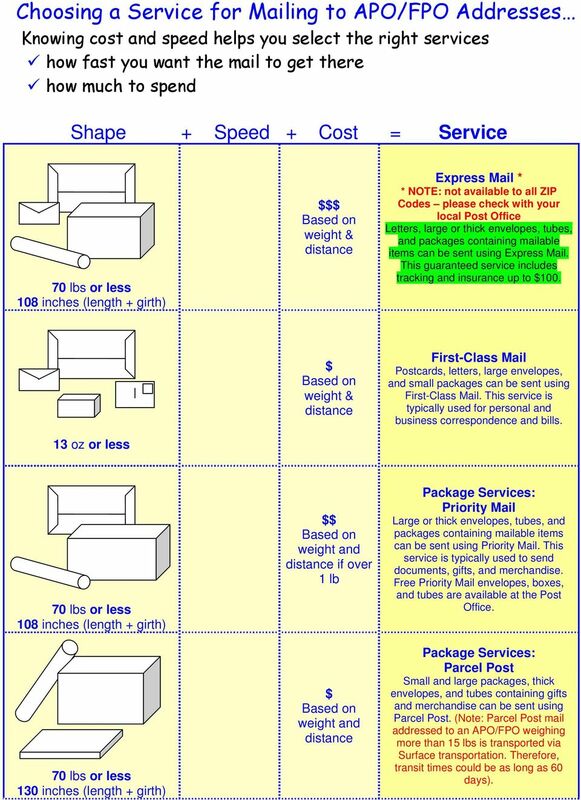 2 Choosing a Service for Mailing to APO/FPO Addresses Knowing cost and speed helps you select the right services how fast you want the mail to get there how much to spend Shape + Speed + Cost = Service 108 inches (length + girth) weight & Express Mail * * NOTE: not available to all ZIP Codes please check with your local Post Office Letters, large or thick envelopes, tubes, and packages containing mailable items can be sent using Express Mail. This guaranteed service includes tracking and insurance up to oz or less weight & First-Class Mail Postcards, letters, large envelopes, and small packages can be sent using First-Class Mail. This service is typically used for personal and business correspondence and bills. 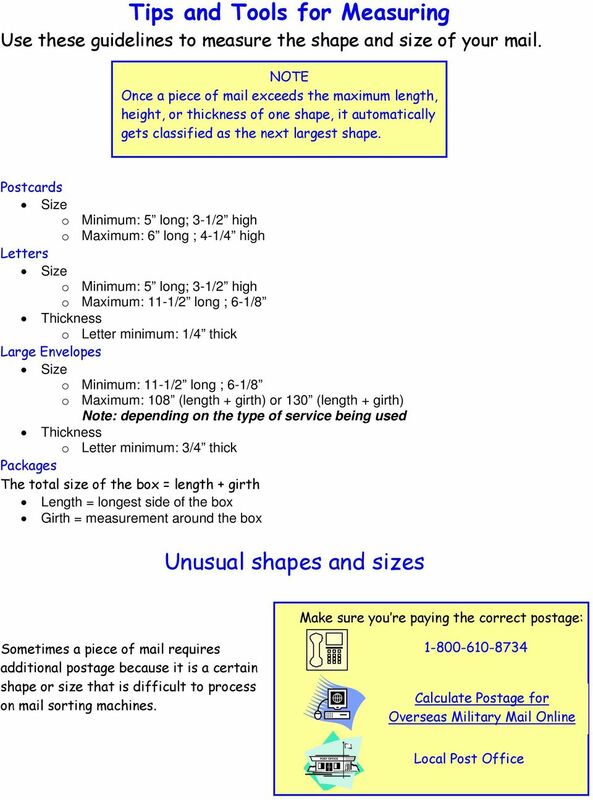 108 inches (length + girth) 130 inches (length + girth) if over 1 lb Priority Mail Large or thick envelopes, tubes, and packages containing mailable items can be sent using Priority Mail. This service is typically used to send documents, gifts, and merchandise. Free Priority Mail envelopes, boxes, and tubes are available at the Post Office. Parcel Post Small and large packages, thick envelopes, and tubes containing gifts and merchandise can be sent using Parcel Post. (Note: Parcel Post mail addressed to an APO/FPO weighing more than 15 lbs is transported via Surface transportation. Therefore, transit times could be as long as 60 days). 3 Shape + Speed + Cost = Service Parcel Airlift (PAL) Space available air transportation of parcels. 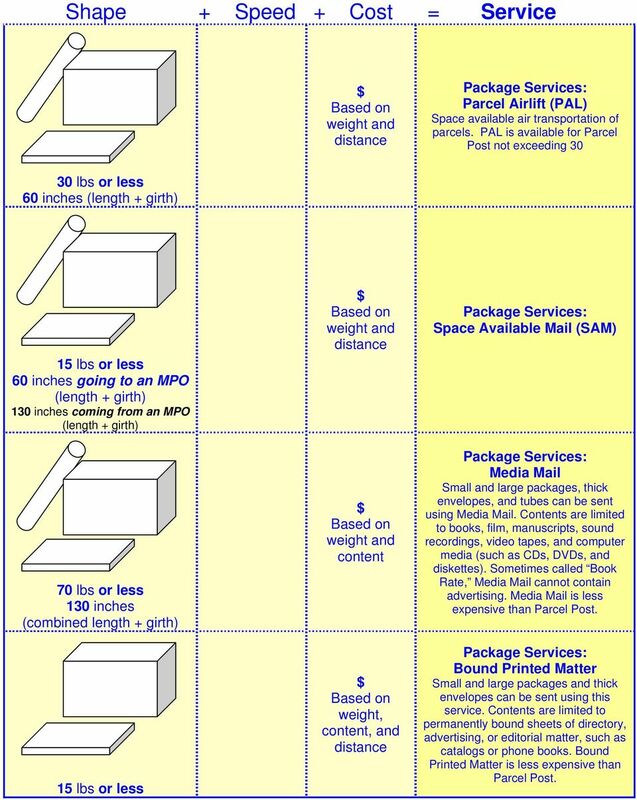 PAL is available for Parcel Post not exceeding lbs or less 60 inches (length + girth) 15 lbs or less 60 inches going to an MPO (length + girth) 130 inches coming from an MPO (length + girth) 130 inches (combined length + girth) 15 lbs or less content weight, content, and Space Available Mail (SAM) Media Mail Small and large packages, thick envelopes, and tubes can be sent using Media Mail. Contents are limited to books, film, manuscripts, sound recordings, video tapes, and computer media (such as CDs, DVDs, and diskettes). Sometimes called Book Rate, Media Mail cannot contain advertising. Media Mail is less expensive than Parcel Post. Bound Printed Matter Small and large packages and thick envelopes can be sent using this service. Contents are limited to permanently bound sheets of directory, advertising, or editorial matter, such as catalogs or phone books. Bound Printed Matter is less expensive than Parcel Post. Q: Are there programs such as Any Service Member or Any Wounded Warrior that allow me to send items to any service member? A: No. This practice is prohibited due to the risks facing deployed military forces.